I arrived in Santa Fe early yesterday evening, dropped my bags at the rented condo where I’ll be spending the next three weeks, called Mrs. T and my mother to let them know that I was in one piece, then went off to dinner with Paul Moravec, composer of The Letter, which opens in twelve days. My trip began with a short working holiday: I flew to Los Angeles and spent two nights in the improbably beautiful Topanga Canyon. I saw a pair of plays at the Will Geer Theatricum Botanicum and stayed at the Tuscali Mountain Inn, an idyllic hillside retreat located a mere quarter-mile from the theater. The hosts are friendly, the food tasty, the furnishings elegant (a Picasso etching was hung next to my desk), the beds comfortable. The last of these was more important than usual: I was greatly in need of sleep, and got plenty of it. As for Paul, he made it to Santa Fe a week ago and has been reporting to me by phone twice daily about the rehearsals (go here to see what he’s been saying). I grew more excited each time I spoke to him. Now the wait is over. I’m here. It’s happening. 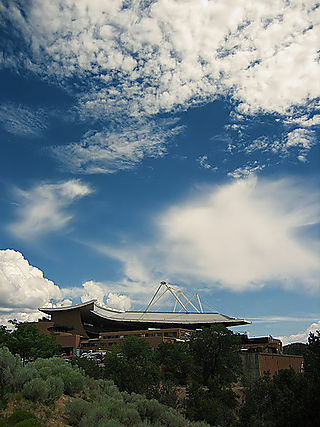 Later this morning I’ll drive to the Santa Fe Opera to attend my first rehearsal. Paul has already told me what to expect: “It’s overwhelming, hearing it being performed for real. You’ll feel the same way when you get here. You’ll want to cry.” I’m sure he’s right–I’ve always been an easy weeper–but once the shock wave has rolled over me, I have no doubt that the press of work will pull me to my feet again. I doubt I’m going to have much time to feel overwhelmed by the unfamiliar sensation of seeing and hearing my words and Paul’s music sung by performers on a stage. Halfway throught he film, in the brief pause between “Epiphany” and “A Little Priest,” I leaned over to Paul and whispered, “This is the mark we have to hit.” He nodded. Paul grinned. “The work waits…and I’m full of joy,” he replied. Then he disappeared into the night. Footnote to a long but satisfying day: I eased myself towards my first night’s sleep in Santa Fe by listening to this. Thanks, Pat.